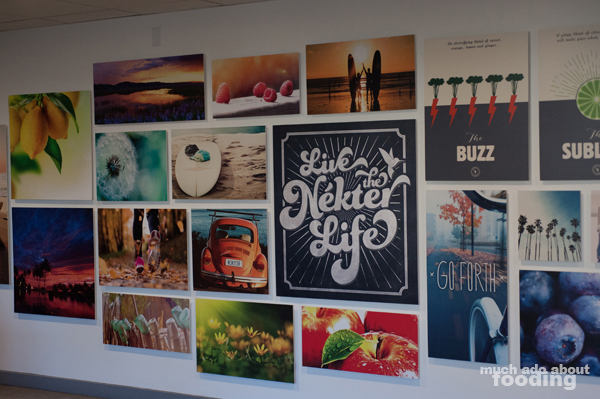 The juice craze that has hit southern California has just continued to grow and grow these days but one of the pioneers in the Orange County area was Nekter Juice Bar who opened up in Costa Mesa in 2010. Co-owners Steve and Alexis Schulze put their concept on the map quickly and have expanded with ease, it seems. 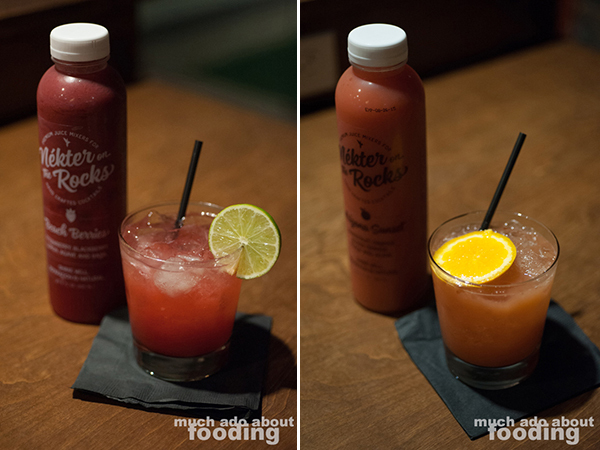 Aside from their juices and acai bowls, they have also become known for their different cleanses, of which I tested one. The 3-day cleanse journey that I experienced and wrote about was an interesting venture out of my dietary comfort zone but does seem to attract many. Now, they're unleashing two new additions to their offerings that will surely draw in a wider audience of customers - cocktail mixers and grab-and-go meals from Bite Me Kitchen. We snagged a sneak peek earlier this week of what's coming. You must know all about Bite Me Kitchen after our awesome interview with the dynamic duo posted last year but if you don't, co-owners Rose and Adam are quite the impressive team along with their passionate staff. The company puts together plant-based meals that not only are good for you but taste phenomenal as well. Imagine our excitement when we found out that their tasty food would be the grab-and-go meals to be found at Nekter locations across Orange County! For those unfamiliar with their fare, the crew brought out samples during the preview and as always, did not disappoint. The Pad Thai (zucchini and carrot noodles tossed with a rainbow of vegetables, cilantro, peanuts, lime, and a Thai peanut-coconut sauce) was bright and crisp with plenty of savory flavors from the peanut-coconut sauce. Their Thai Peanut Wrap (spinach tortilla wrapped around crisp vegetables, yam puree, quinoa, and a slightly spicy peanut-coconut dipping sauce) could easily be the perfect thing to snag for a wholesome lunch. I really dug their Carnitas Bowl (jackfruit carnitas on a bed of Romaine lettuce and quinoa tossed with black beans, tomatoes, sweet corn, ripe olives, and ancho cream) because the marinated jackfruit had its inherent sweetness but was also prepared with plenty of hearty seasonings to imitate the feel of carnitas. Those wanting really light could try their Just Beet It Salad (spinach, roasted red beets, rosemary butternut squash, sliced almonds, almond feta, quinoa, and a bright balsamic vinaigrette) which represented more of the traditional "healthy" meal that you might imagine. Overall, what excellent options people will have at Nekter! We've always admired the attention that Bite Me Kitchen has put on making sure their foods are balanced and nutritionally satisfactory for the body; these will be great additions to the Nekter lifestyle. But now, you cannot forget that sometimes, there is a bit of freedom one needs to have when living a balanced lifestyle. Alexis of Nekter spoke to us about the desire to still enjoy oneself but also indulging a bit. 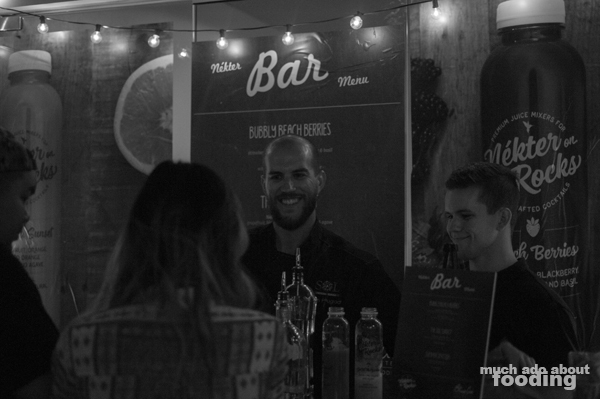 Why not mix your alcohol with the best of fruits and juices around? The addition of grab-and-go meals through Bite Me Kitchen was spurred on by her own purchases of the business' food as a regular customer; she enjoyed those so much that a partnership made sense. 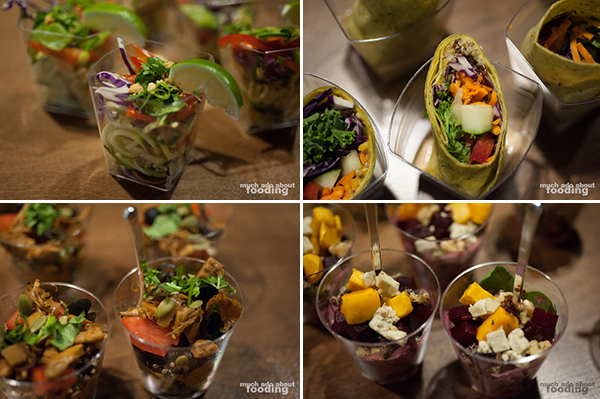 The food followed the vision that Nekter has of good health and happiness. 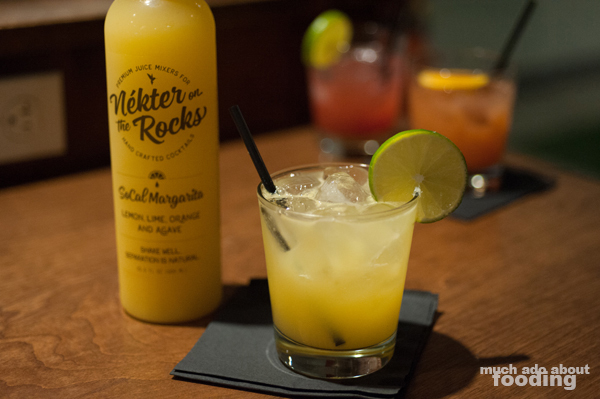 The Nekter on the Rocks mixers are to follow as well. 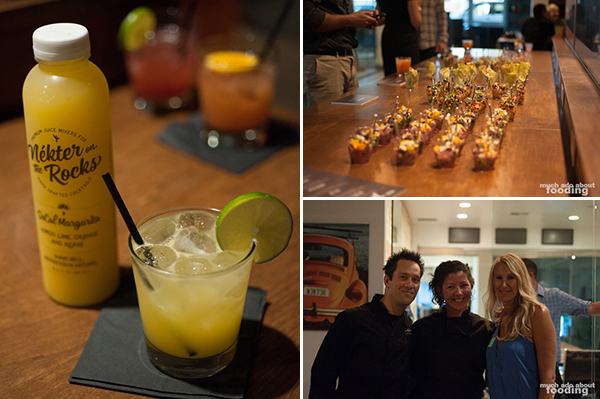 To help showcase these in action, SOL Cocina was there that evening to demonstrate how versatile these pure-juice blends could be and how much of a difference they make when used instead of sugary purees or commercial juices. We started with the Bubbly Beach Berries (Nekter on the Rocks Mix of strawberries, blackberries, lemon, agave, and basil along with Blue Ice vodka, mint, and a splash of champagne) which was really strong on the berries since they were the star of the mix. The Sol Sunset (Nekter on the Rock Mix of grapefruit, blood orange, orange, peach, and agave along with premium tequila) was my preferred of the three that night as the citrus played well with the alcohol but still shone through with their signature tartness. Then there was the Summer Spritzer (Nekter on the Rocks Mix of lemon, orange, lime, and agave along with Blue Ice vodka and club soda), a refreshing and bright cocktail perfect for the season.